I let them out of the box!! 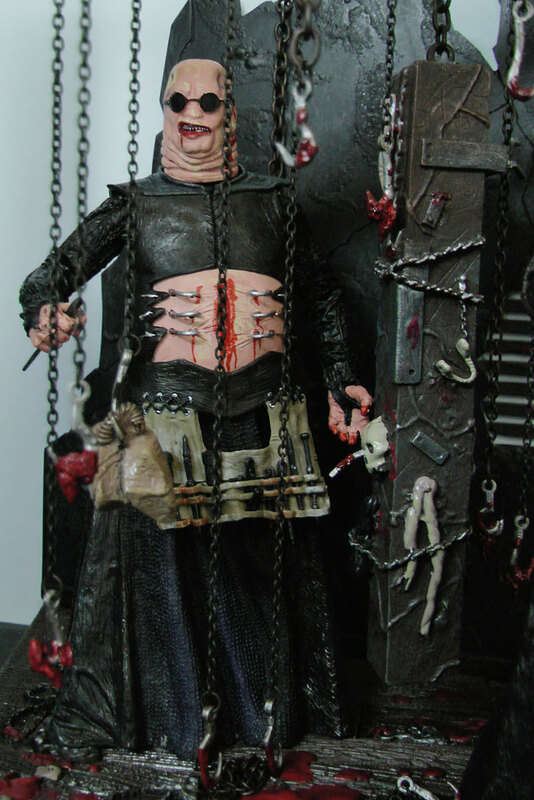 Cliver Barker’s Hellraiser Cenobite Lair was released by NECA in 2005 as a exclusive collectible available only at Spencers Gifts. 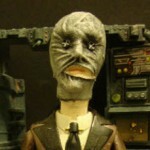 This is without a doubt one of the best toys representing the 1987 Hellraiser film. 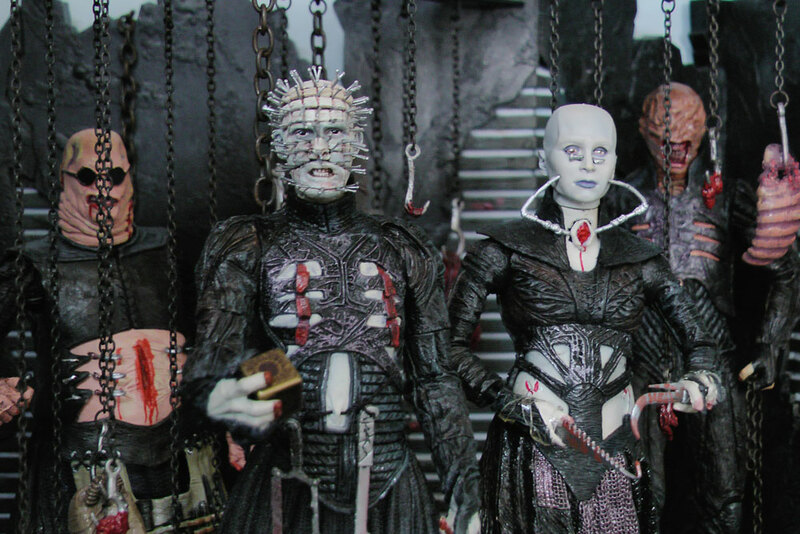 This limited edition (only 2500 worldwide) includes all four of the original Cenobites: Pinhead, Chatterer, Butterball and Female II. 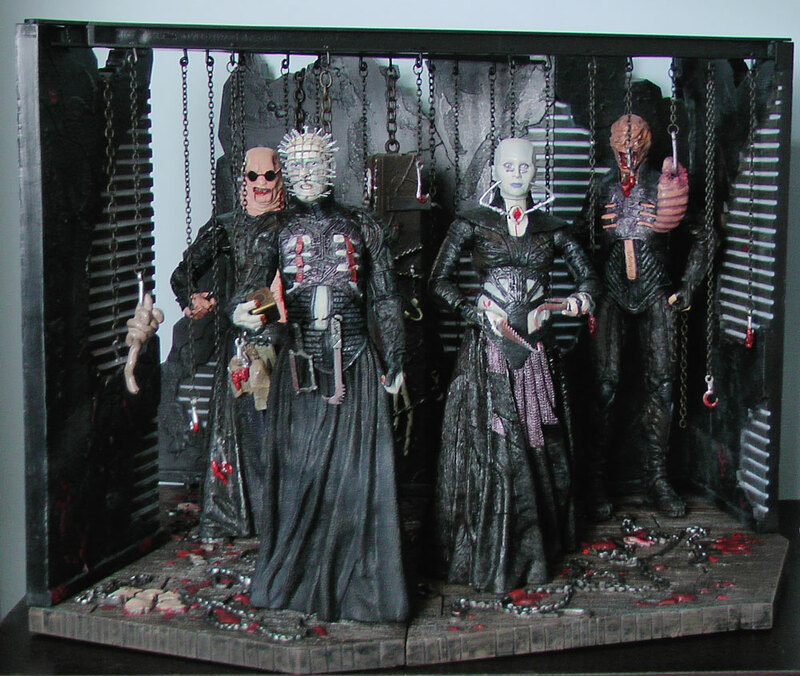 Each figure has their own set of weapons and pinhead has Lemarchand’s puzzle box. 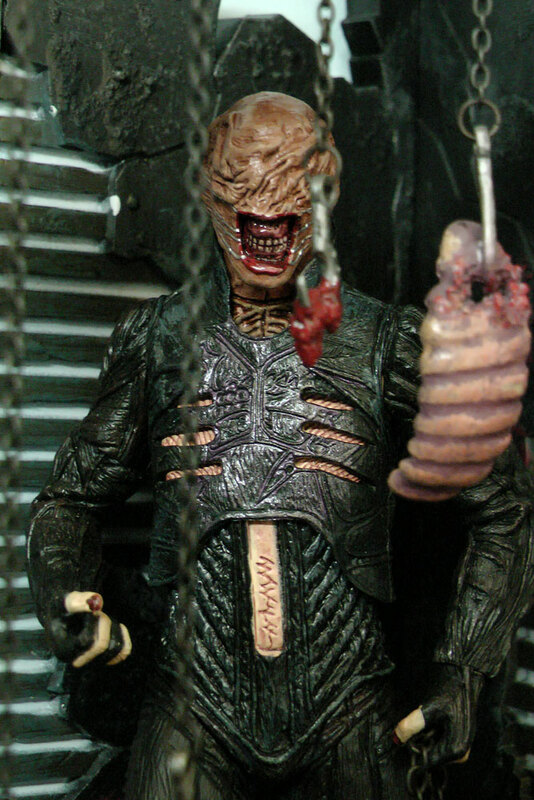 The lair also includes a gory attic scene, complete with binding chains, blood covered hooks, gut piles on the floor, bits of human flesh, and the torture pillar, which is a relic of sorts from the Cenobite realm. The set also comes with a signed Pinhead concept drawing by Clive Barker, which I have framed in my office. 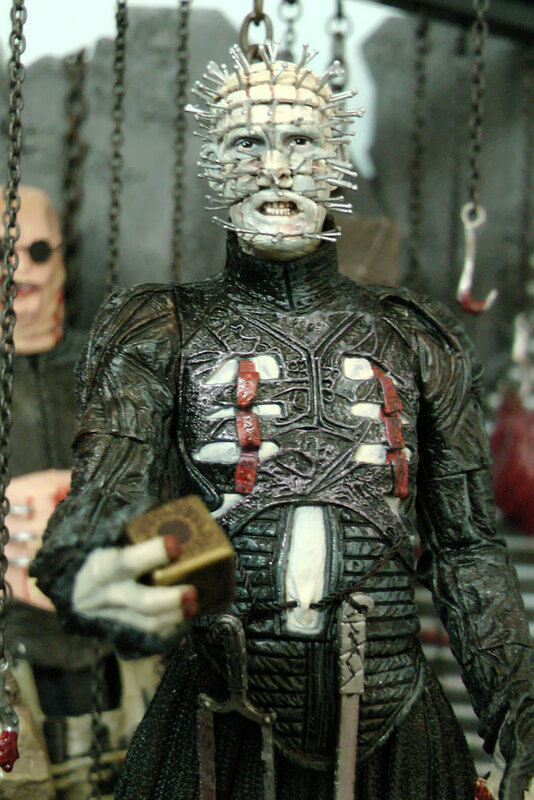 I hope to someday have Doug Bradley, the actor who portrayed Pinhead in the movies, also sign it. Some assembly was required. The attic walls and joints must be fastened together and without instructions this was a bit challenging. Cuss words flew expertly as I struggled to snap the pieces together. My only other complaint is that the dangling chains are likely to fall when the set is moved. My complaints are minor – this set is amazing. This set is no longer available in stores. It can be found on Ebay. The price will vary depending on box condition. Expect to pay in the range of 100 to 300 dollars. Loose figures will sell for less. If you buy loose figures you probably won’t get the signed Clive Barker artwork and it might be hard to find a set that’s not missing some chains or a weapon. If you love the Hellraiser universe like I do, then this box set is worth the search and the money. Pros: Highly detailed. Great display piece. Autographed artwork included. Perfect for any Hellraiser fan. Cons: No assembly instructions. Chains fall when moved. No longer sold in stores. What’s the website? I wouldn’t have a problem with this as long as credit was given.